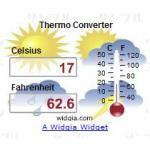 Calculate the difference between celsius and fahrenheit when your travel to another country. Copy all of the displayed "Installation Code" and paste the widget where you want it on your blog. For details on installation, please check the How to Use Widgets How to Use Widgets section.